China's cross-border capital flows and the yuan's exchange rate are expected to remain stable, spokesperson of the nation's foreign exchange regulator said on Thursday. China's cross-border capital flows and the yuan's exchange rate are expected to remain stable, despite potential risks from Sino-US trade friction, monetary policy tightening of other major economies and the country's rising foreign debt, a senior official from the nation's foreign exchange regulator said on Thursday. The impact of Sino-US trade friction on China's balance of international payments is "overall controllable," and the current account — which records a nation's transactions with the rest of the world, which include trade of goods and services, earnings on cross-border investment and transfer payments — will "become more balanced and within a reasonable range," Wang Chunying, spokeswoman of the State Administration of Foreign Exchange, said at a news conference. Wang said China's foreign exchange reserves rose to US$3.14 trillion at the end of March, US$2.9 billion higher than that recorded at the end of last year, official data show. The yuan's central parity rate, its daily trading reference, against the US dollar went up by 3.8 percent in the first three months, with slight two-way fluctuations. 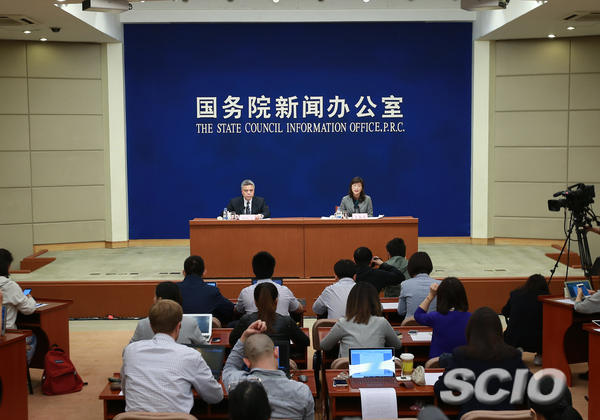 Those are all proof of stable cross-border capital flow, supported by sound domestic policies and economic fundamentals and the global economic recovery, the SAFE spokeswoman said. Zhang Yuyan, director of the Institute of World Economics and Politics at the Chinese Academy of Social Sciences, said "the Sino-US trade friction brings significant uncertainties in the world's two largest economies, and I don't expect any intensified tension spreading into the financial sector." He said this excludes the possibility of competitive currency depreciation of the yuan or fierce fluctuations of cross-border capital flows. "We cannot rule out risks of much more serious trade friction between the US and China, given the possible dynamics in such a high-stakes game," said Louis Kuijs, head of Asia Economics at Oxford Economics, a British think tank. "But a full-blown trade war remains unlikely, and the solid global demand momentum will continue to support China's exports in 2018." Despite more fluctuations in global financial markets recently, which occurred as a result of the monetary policy normalization process in the world's major economies, "the stability factors still remain the dominant force," said Wang, of SAFE. The interest rate hikes by the United States and some other countries and some central banks' balance sheet shrinking "are within the market's expectation," she said. In response to a question about whether the country's rising foreign debt will spark financial risks, Wang said that the debt level is still far below the internationally accepted warning line and therefore the risks facing China is controllable. The foreign exchange regulator pledged to further deepen foreign exchange rate reform and gradually achieve capital account liberalization as part of the country's further opening-up strategies. Wang also said that SAFE plans to raise the investment quota in overseas markets under the pilot programs of the Qualified Domestic Limited Partnership and the Qualified Domestic Investment Enterprise, which is in line with the country's new vow to expand economic opening-up, but it will be carried out on the basis of implementing cautious risk control and regulatory measures under the macro-prudential assessment framework.